Urreizti R*, Mayer K*, Evrony GD*, Said E, Castilla-Vallmanya L, Cody NAL, Plasencia G, Gelb BD, Grinberg D, Brinkmann U, Webb BD, Balcells S.
DPH1 variants have been associated with an ultra-rare and severe neurodevelopmental disorder, mainly characterized by variable developmental delay, short stature, dysmorphic features, and sparse hair. We have identified four new patients (from two different families) carrying novel variants in DPH1, enriching the clinical delineation of the DPH1 syndrome. Using a diphtheria toxin ADP-ribosylation assay, we have analyzed the activity of seven identified variants and demonstrated compromised function for five of them [p.(Leu234Pro); p.(Ala411Argfs*91); p.(Leu164Pro); p.(Leu125Pro); and p.(Tyr112Cys)]. We have built a homology model of the human DPH1–DPH2 heterodimer and have performed molecular dynamics simulations to study the effect of these variants on the catalytic sites as well as on the interactions between subunits of the heterodimer. The results show correlation between loss of activity, reduced size of the opening to the catalytic site, and changes in the size of the catalytic site with clinical severity. This is the first report of functional tests of DPH1 variants associated with the DPH1 syndrome. We demonstrate that the in vitro assay for DPH1 protein activity, together with structural modeling, are useful tools for assessing the effect of the variants on DPH1 function and may be used for predicting patient outcomes and prognoses. Evrony GD*, Cordero DR*, Shen J*, Partlow JN, Yu TW, Rodin RE, Hill RS, Coulter ME, Lam AN, Jayaraman D, Gerrelli D, Diaz DG, Santos C, Morrison V, Galli A, Tschulena U, Wiemann S, Martel MJ, Spooner B, Ryu SC, Elhosary PC, Richardson JM, Tierney D, Robinson CA, Chibbar R, Diudea D, Folkerth R, Wiebe S, Barkovich AJ, Mochida GH, Irvine J, Lemire EG, Blakley P, Walsh CA. While next-generation sequencing has accelerated the discovery of human disease genes, progress has been largely limited to the “low hanging fruit” of mutations with obvious exonic coding or canonical splice site impact. In contrast, the lack of high-throughput, unbiased approaches for functional assessment of most noncoding variants has bottlenecked gene discovery. We report the integration of transcriptome sequencing (RNA-seq), which surveys all mRNAs to reveal functional impacts of variants at the transcription level, into the gene discovery framework for a unique human disease, microcephaly-micromelia syndrome (MMS). MMS is an autosomal recessive condition described thus far in only a single First Nations population and causes intrauterine growth restriction, severe microcephaly, craniofacial anomalies, skeletal dysplasia, and neonatal lethality. Linkage analysis of affected families, including a very large pedigree, identified a single locus on Chromosome 21 linked to the disease (LOD > 9). Comprehensive genome sequencing did not reveal any pathogenic coding or canonical splicing mutations within the linkage region but identified several nonconserved noncoding variants. RNA-seq analysis detected aberrant splicing in DONSON due to one of these noncoding variants, showing a causative role for DONSON disruption in MMS. We show that DONSON is expressed in progenitor cells of embryonic human brain and other proliferating tissues, is co-expressed with components of the DNA replication machinery, and that Donson is essential for early embryonic development in mice as well, suggesting an essential conserved role for DONSON in the cell cycle. Our results demonstrate the utility of integrating transcriptomics into the study of human genetic disease when DNA sequencing alone is not sufficient to reveal the underlying pathogenic mutation. Evrony GD*, Lee E*, Park PJ, Walsh CA. Lodato MA*, Woodworth MB*, Lee S*, Evrony GD, Mehta BK, Karger A, Lee S, Chittenden TW, Cai X, Lovelace JL, Lee E, Park PJ, Walsh CA. Evrony GD*, Lee E*, Mehta BK, Benjamini Y, Johnson RM, Cai X, Yang L, Haseley P, Lehmann HS, Park PJ, Walsh CA. 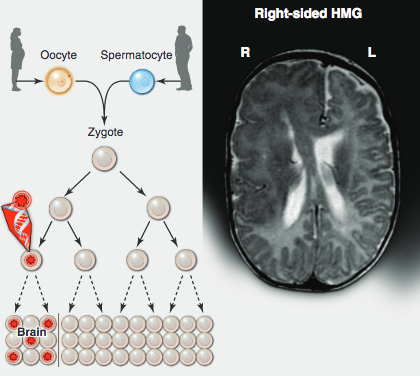 Somatic mutations occur during brain development and are increasingly implicated as a cause of neurogenetic disease. However, the patterns in which somatic mutations distribute in the human brain are unknown. We used high-coverage whole-genome sequencing of single neurons from a normal individual to identify spontaneous somatic mutations as clonal marks to track cell lineages in human brain. Somatic mutation analyses in >30 locations throughout the nervous system identified multiple lineages and sublineages of cells marked by different LINE-1 (L1) retrotransposition events and subsequent mutation of poly-A microsatellites within L1. One clone contained thousands of cells limited to the left middle frontal gyrus, whereas a second distinct clone contained millions of cells distributed over the entire left hemisphere. These patterns mirror known somatic mutation disorders of brain development and suggest that focally distributed mutations are also prevalent in normal brains. 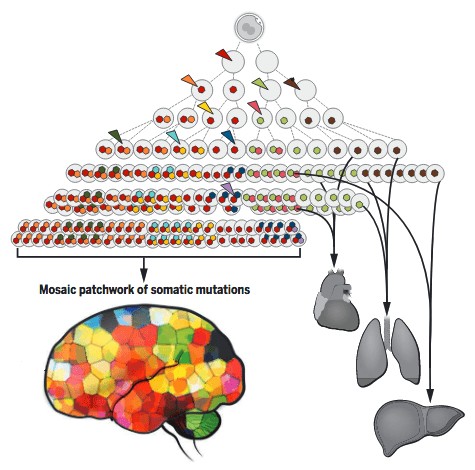 Single-cell analysis of somatic mutation enables tracing of cell lineage clones in human brain. Cai X, Evrony GD, Lehmann HS, Elhosary PC, Mehta B, Poduri A, Walsh CA. De novo copy-number variants (CNVs) can cause neuropsychiatric disease, but the degree to which they occur somatically, and during development, is unknown. Single-cell whole-genome sequencing (WGS) in >200 single cells, including >160 neurons from three normal and two pathological human brains, sensitively identified germline trisomy of chromosome 18 but found most (≥95%) neurons in normal brain tissue to be euploid. Analysis of a patient with hemimegalencephaly (HMG) due to a somatic CNV of chromosome 1q found unexpected tetrasomy 1q in ∼20% of neurons, suggesting that CNVs in a minority of cells can cause widespread brain dysfunction. Single-cell analysis identified large (>1 Mb) clonal CNVs in lymphoblasts and in single neurons from normal human brain tissue, suggesting that some CNVs occur during neurogenesis. Many neurons contained one or more large candidate private CNVs, including one at chromosome 15q13.2-13.3, a site of duplication in neuropsychiatric conditions. 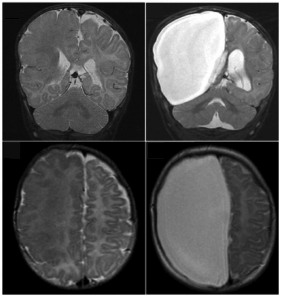 Large private and clonal somatic CNVs occur in normal and diseased human brains. Reiff RE*, Ali BR*, Baron B, Yu TW, Ben-Salem S, Coulter ME, Schubert CR, Hill RS, Akawi NA, Al-Younes B, Kaya N, Evrony GD, Al-Saffar M, Felie JM, Partlow JN, Sunu CM, Schembri-Wismayer P, Alkuraya FS, Meyer BF, Walsh CA, Al-Gazali L, Mochida GH. Whereas many genes associated with intellectual disability (ID) encode synaptic proteins, transcriptional defects leading to ID are less well understood. We studied a large, consanguineous pedigree of Arab origin with seven members affected with ID and mild dysmorphic features. Homozygosity mapping and linkage analysis identified a candidate region on chromosome 17 with a maximum multipoint logarithm of odds score of 6.01. Targeted high-throughput sequencing of the exons in the candidate region identified a homozygous 4-bp deletion (c.169_172delCACT) in the METTL23 (methyltransferase like 23) gene, which is predicted to result in a frameshift and premature truncation (p.His57Valfs*11). Overexpressed METTL23 protein localized to both nucleus and cytoplasm, and physically interacted with GABPA (GA-binding protein transcription factor, alpha subunit). GABP, of which GABPA is a component, is known to regulate the expression of genes such as THPO (thrombopoietin) and ATP5B (ATP synthase, H+ transporting, mitochondrial F1 complex, beta polypeptide) and is implicated in a wide variety of important cellular functions. Overexpression of METTL23 resulted in increased transcriptional activity at the THPO promoter, whereas knockdown of METTL23 with siRNA resulted in decreased expression of ATP5B, thus revealing the importance of METTL23 as a regulator of GABPA function. The METTL23 mutation highlights a new transcriptional pathway underlying human intellectual function. Bae BI*, Tietjen I*, Atabay KD, Evrony GD, Johnson MB, Asare E, Wang PP, Murayama AY, Im K, Lisgo SN, Overman L, Sestan N, Chang BS, Barkovich AJ, Grant PE, Topcu M, Politsky J, Okano H, Piao X, Walsh CA. 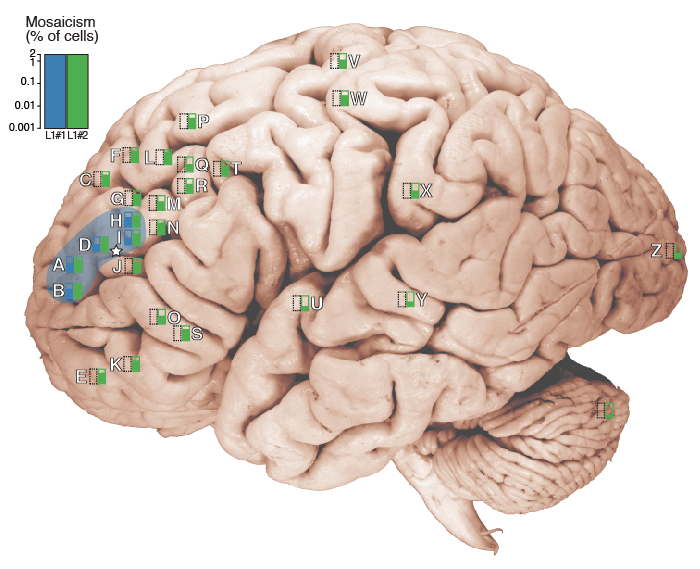 The human neocortex has numerous specialized functional areas whose formation is poorly understood. Here, we describe a 15–base pair deletion mutation in a regulatory element of GPR56 that selectively disrupts human cortex surrounding the Sylvian fissure bilaterally including “Broca’s area,” the primary language area, by disrupting regional GPR56 expression and blocking RFX transcription factor binding. GPR56 encodes a heterotrimeric guanine nucleotide–binding protein (G protein)–coupled receptor required for normal cortical development and is expressed in cortical progenitor cells. GPR56 expression levels regulate progenitor proliferation. GPR56 splice forms are highly variable between mice and humans, and the regulatory element of gyrencephalic mammals directs restricted lateral cortical expression. Our data reveal a mechanism by which control of GPR56 expression pattern by multiple alternative promoters can influence stem cell proliferation, gyral patterning, and, potentially, neocortex evolution. Genetic mutations causing human disease are conventionally thought to be inherited through the germ line from one’s parents and present in all somatic (body) cells, except for most cancer mutations, which arise somatically. Increasingly, somatic mutations are being identified in diseases other than cancer, including neurodevelopmental diseases. 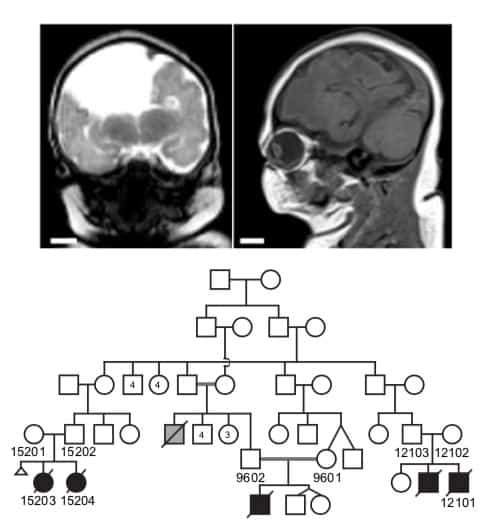 Somatic mutations can arise during the course of prenatal brain development and cause neurological disease—even when present at low levels of mosaicism, for example—resulting in brain malformations associated with epilepsy and intellectual disability. Novel, highly sensitive technologies will allow more accurate evaluation of somatic mutations in neurodevelopmental disorders and during normal brain development. Yang YJ, Baltus AE, Matthew RS, Murphy EA, Evrony GD, Gonzalez DM, Wang EP, Marshall-Walker CA, Barry BJ, Jernej M, Tatarakis A, Mahajan MA, Samuels HH, Shi Y, Golden JA, Mahajnah M, Shenhav R, Walsh CA. Microcephaly is a neurodevelopmental disorder causing significantly reduced cerebral cortex size. Many known microcephaly gene products localize to centrosomes, regulating cell fate and proliferation. Here, we identify and characterize a nuclear zinc finger protein, ZNF335/NIF-1, as a causative gene for severe microcephaly, small somatic size, and neonatal death. Znf335 null mice are embryonically lethal, and conditional knockout leads to severely reduced cortical size. RNA-interference and postmortem human studies show that ZNF335 is essential for neural progenitor self-renewal, neurogenesis, and neuronal differentiation. 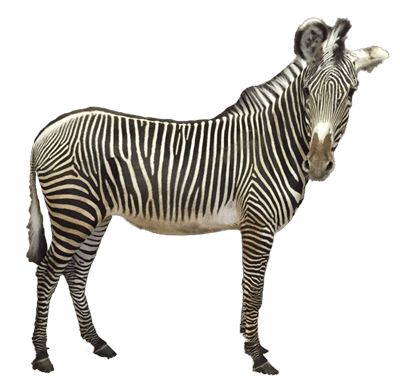 ZNF335 is a component of a vertebrate-specific, trithorax H3K4-methylation complex, directly regulating REST/NRSF, a master regulator of neural gene expression and cell fate, as well as other essential neural-specific genes. Our results reveal ZNF335 as an essential link between H3K4 complexes and REST/NRSF and provide the first direct genetic evidence that this pathway regulates human neurogenesis and neuronal differentiation. Evrony GD*, Cai X*, Lee E, Hills LB, Elhosary PC, Lehmann HS, Parker JJ, Atabay KD, Gilmore EC, Poduri A, Park PJ, Walsh CA. A major unanswered question in neuroscience is whether there exists genomic variability between individual neurons of the brain, contributing to functional diversity or to an unexplained burden of neurological disease. To address this question, we developed a method to amplify genomes of single neurons from human brains. Because recent reports suggest frequent LINE-1 (L1) retrotransposition in human brains, we performed genome-wide L1 insertion profiling of 300 single neurons from cerebral cortex and caudate nucleus of three normal individuals, recovering >80% of germline insertions from single neurons. While we find somatic L1 insertions, we estimate <0.6 unique somatic insertions per neuron, and most neurons lack detectable somatic insertions, suggesting that L1 is not a major generator of neuronal diversity in cortex and caudate. We then genotyped single cortical cells to characterize the mosaicism of a somatic AKT3 mutation identified in a child with hemimegalencephaly. 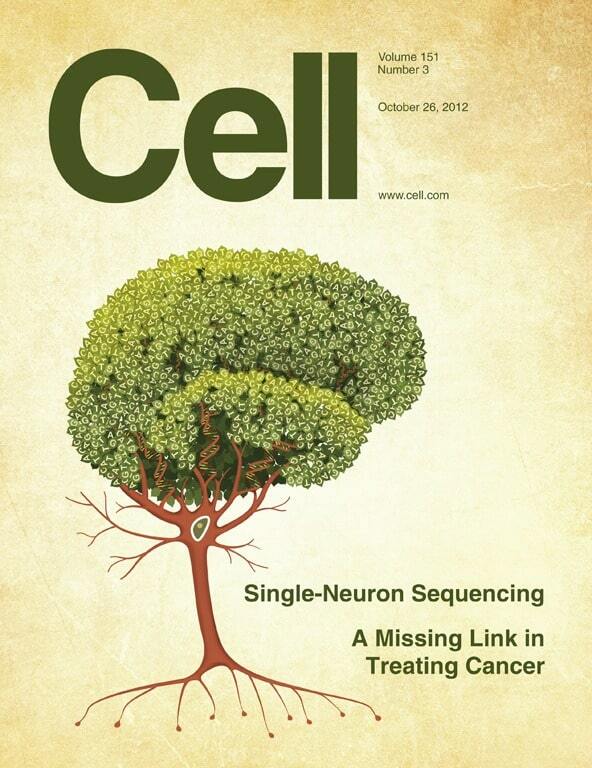 Single-neuron sequencing allows systematic assessment of genomic diversity in the human brain. Poduri A, Evrony GD, Cai X, Elhosary PC, Beroukhim R, Lehtinen MK, Hills LB, Heinzen EL, Hill A, Hill RS, Barry BJ, Bourgeois BFD, Riviello JJ, Barkovich AJ, Black PM, Ligon KL, Walsh CA. Hemimegalencephaly (HMG) is a developmental brain disorder characterized by an enlarged, malformed cerebral hemisphere, typically causing epilepsy that requires surgical resection. We studied resected HMG tissue to test whether the condition might reflect somatic mutations affecting genes critical to brain development. We found that two out of eight HMG samples showed trisomy of chromosome 1q, which encompasses many genes, including AKT3, a gene known to regulate brain size. A third case showed a known activating mutation in AKT3 (c.49G→A, creating p.E17K) that was not present in the patient’s blood cells. Remarkably, the E17K mutation in AKT3 is exactly paralogous to E17K mutations in AKT1 and AKT2 recently discovered in somatic overgrowth syndromes. We show that AKT3 is the most abundant AKT paralog in the brain during neurogenesis and that phosphorylated AKT is abundant in cortical progenitor cells. Our data suggest that somatic mutations limited to the brain could represent an important cause of complex neurogenetic disease. Townsend SA*, Evrony GD*, Gu FX, Schulz MP, Brown RH Jr, Langer R.
The use of nanoparticles for targeted drug delivery is often facilitated by specific conjugation of functional targeting molecules to the nanoparticle surface. We compared different biotin-binding proteins (avidin, streptavidin, or neutravidin) as crosslinkers to conjugate proteins to biodegradable nanoparticles prepared from poly(lactic-co-glycolic acid) (PLGA)–polyethylene glycol (PEG)-biotin polymers. Avidin gave the highest levels of overall protein conjugation, whereas neutravidin minimized protein non-specific binding to the polymer. The tetanus toxin C fragment (TTC), which is efficiently retrogradely transported in neurons and binds to neurons with high specificity and affinity, retained the ability to bind to neuroblastoma cells following amine group modifications. TTC was conjugated to nanoparticles using neutravidin, and the resulting nanoparticles were shown to selectively target neuroblastoma cells in vitro. TTC-conjugated nanoparticles have the potential to serve as drug delivery vehicles targeted to the central nervous system.